Downstream from Manzana Schoolhouse, along Sisquoc River, are several homestead sites that date back to the late 1800s. 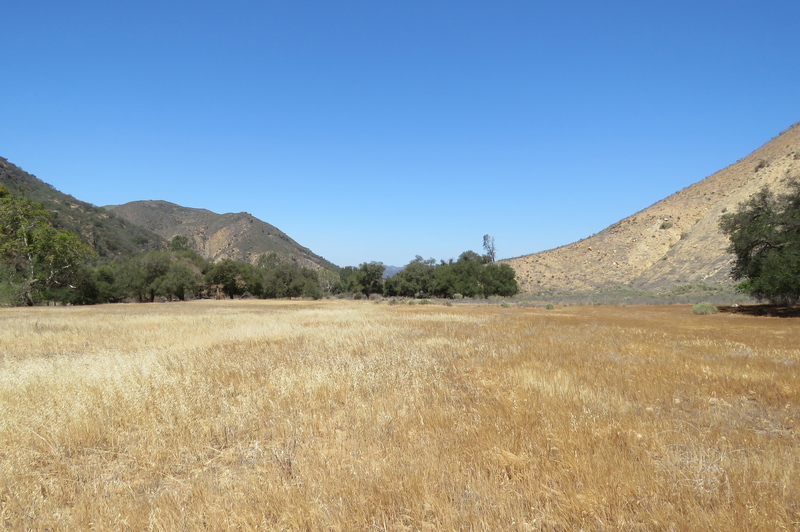 The sites are from a time when settlers made their way east from Santa Maria to homestead federal land in the backcountry that was available through the Homestead Act of 1862. At one time there were as many as 200 people living along the Sisquoc River and its tributaries. At the core of their community was a group of about a dozen families interrelated through marriage. The settlers built cabins and cultivated land to prove up on their claims, and many also raised cattle to make a living. The homesteading period along the Sisquoc River and its tributaries was short-lived. Several factors combined that eventually caused most of these settlers to move out of the area. Changes in forest service policy curtailed the homesteaders practice of burning off chaparral in the fall to create grazing land. The 1890s marked the beginning of an extended period of drought. And in 1899, Sisquoc Ranch began to lock the gates on the wagon road that passed through its property. The road had served as the main route for the settlers to reach Santa Maria where they could sell their goods and purchase supplies. Today, little remains of these homestead sites, but it is still possible to locate them, and in some case view remnants of the structures. 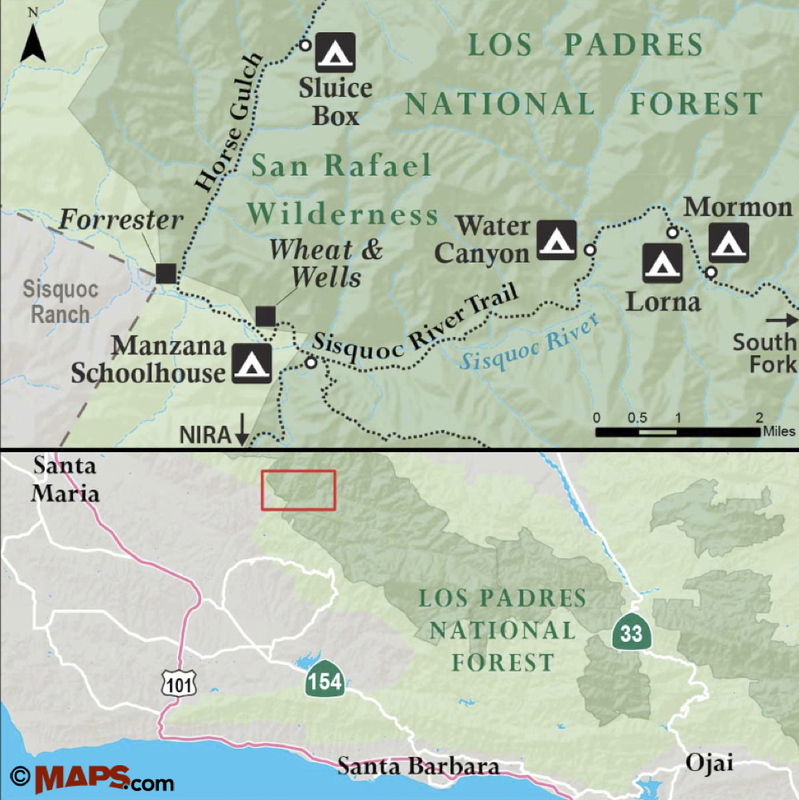 The sites below Manzana Schoolhouse can be reached by hiking downstream along Sisquoc River Trail. There are several routes that lead to Manzana Schoolhouse, the most commonly used is Manzana Trail. The trailhead is reached from State Route 154 by way of Happy Canyon Road, and is located just before Nira Campground, where the road ends. From the trailhead it is about 8.5 miles to Manzana Schoolhouse, and so the homestead sites are best visited as part of a backpacking trip. The campground at Manzana Schoolhouse has six campsites, each with a picnic table and metal fire ring. However, because of the drought both Manzana Creek and Sisquoc River are dry at the camp. From Manzana Schoolhouse, Sisquoc River Trail continues downstream along the road used by these early settlers. The unpaved road crosses Sisquoc River and leads up to Wheat Mesa, and continues past the Wells and Wheat homestead sites. Hiram Preserved Wheat was the patriarch of the community and Hiram Hiley Preserved Wells was one of his grandsons. The road passes the Wells homestead site, which is recognizable by the chimney that is still standing there. The Wheat homestead is located at the western edge of the mesa and is less noticeable as only a low pile of stones from the chimney remain. Past the Wheat homestead, the road descends down to the river and crosses it. The trail then continues down a dry flood channel before veering to the right, and crossing Sisquoc River again. From here, the road continues along an open flat on the north side of the river. The flat is sometimes referred to as Miller’s Flat. John Miller homesteaded the site, but didn’t prove up on his claim. At about the 2-mile mark from Manzana Schoolhouse, the road arrives at Horse Gulch Creek. Just past the creek, the road ends at the locked gate for Sisquoc Ranch. Please respect private property. From the National Forest side of the fence one can view the remains of the Forrester homestead, which includes part of the rock wall and foundation, as well as the chimney. Known as “Whispirin’ Ed” because of his booming voice, Edward Everett Forrester was born in West Virginia in 1860. In 1880, Forrester arrived in Santa Maria, where he worked part-time as a blacksmith. Two years later he married Emily Malinda Wells, Hiram Hiley Preserved Wells’ sister, and in 1883, joined the settlers living along Sisquoc River and Manzana Creek. Forrester homesteaded at the mouth of Horse Gulch Canyon, then known as Brush Creek. He built a redwood sluice that diverted water from Horse Gulch to irrigate his orchard, which included apple, peach, pear and plum trees. He ran cattle, and on the flat terraces along the river had fields of alfalfa and hay. The Forresters also raised goats and turkeys, and at one time were reported to have 2,500 goats. On their property was a barn and several other buildings. Forrester had two brothers, Lucien Leonidas and William Merchant, both of who lived upstream along Sisquoc River. Their mother, Cassandra, lived with the Forresters at Horse Gulch, until she passed away in 1895. Her grave is on a small flat on the ridge just east of Horse Gulch. Forrester added additional parcels to his property until he had a fairly large holding. When Sisquoc Ranch commissioned a survey in 1899 of the Rancho Sisquoc land grant boundary, it was determined that the Forrester home lay just within the ranch’s property. The survey proved a point of contention between Forrester and the ranch, and later surveys only complicated the matter. In 1901, Forrester moved to Imperial Valley where his family joined him two years later. The Horse Gulch property reverted to the federal government, and later through land exchanges portions of the property, including the site of the Forrester home, became part of Sisquoc Ranch. After the Forresters left the area, the home was leased to the Garcia Family. It’s said that two of the Garcia’s sons died of typhoid at the home and are buried near Cassandra Forrester. Further up Horse Gulch Canyon was the homestead Fred Carver, who sold the property in 1895, to William H. Elliot. The site was located on an open flat above what is now Sluice Box Camp. It’s said that some of the homesteaders used to sluice for gold from the gravel in the creek bed near the camp. The camp is about four miles upstream from Sisquoc River, on the eastern side of the creek. The trail through the canyon is overgrown and does require some effort to follow. Downstream from the Forrester homestead were several other homestead sites that are now part of Sisquoc Ranch. The mesa just west of Horse Gulch was said to have been homesteaded by William K. Hobson. Hobson was related to the Tunnell family through marriage, and was the second husband of Eliza Tunnell. Her brothers, William and George, had homesteads further down river. Their father Martin Luther Tunnell was a veteran of the Mexican-American War and was one of the early settlers of the Santa Maria Valley. Martin Luther Tunnel and his wife had ten children, and their ranch was located in what is now downtown Santa Maria. In 1882, William Tunnell homesteaded along the north side of Sisquoc River, just west of the Hobson homestead. William Tunnell built a two-story house made from native pine cut at the Davis sawmill. The floor was made of sycamore, which was tongued and grooved by Dave Spaulding, who operated the mill with the Davises. When the northern boundary of Sisquoc Ranch was surveyed it was found that most of his property, including the house, lay within the ranch boundary. In 1899, William Tunnel sold his land to Sisquoc Ranch and moved to Santa Maria, where he continued ranching. The house was later used by Sisquoc Ranch as line cabin for its cattle operations. Downstream from William Tunnell’s homestead was the homestead of his brother, George. His property was also found to be within the ranch boundary, and he too sold his land to Sisquoc Ranch and moved on. George and his brother Henry jointly owned property in Tepusquet Canyon, and after their father died in 1903, inherited part of the property in Santa Maria. Upstream from Manzana Schoolhouse along Sisquoc River are a half dozen more homesteads sites in what is now San Rafael Wilderness. This is the fourth in a series of articles on the homesteads along Manzana Creek and Sisquoc River. Article appears in section A of today’s edition of Santa Barbara News-Press. The next article will cover the homesteads along the Sisquoc between Manzana Schoolhouse and Mormon Camp.